Normally, silos are remote from the production process and can tend to get neglected and forgotten. 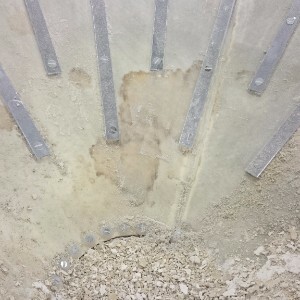 The importance of a healthy silo discharge aid only becomes apparent when they fail, and sometimes this can stop the whole production process. Do these image look familiar? 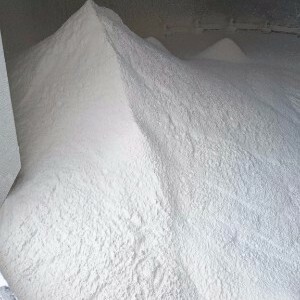 If you are having problems feeding the process, suffering from material waste issues or you are having a hygiene problem, you should be thinking about your silos. When was the last time you checked the condition of your bin discharger? Are the alignment and gap settings in good order? Are the flexible seals and explosion suppression bands in good condition? Telephone Zeppelin Systems on 01623 753291 or click here for more information. The problem can be less obvious with fluidised discharge aids, until they fail completely. Then there can be a potential long lead time for replacement or repairs. Fluid bed type systems, if used correctly, can have a very long maintenance free life (10 years +), but if they have been subjected to condensation or water in the air supply, their efficiency decreases. This causes the structure to become impregnated and caking occurs. The image to the right shows a fluid bed that was almost completely caked. Once this had been scraped off the evidence of water damage was clear. When disassembled the air plenum was found to be completely full – this represents a risk of poor hygiene (e.g. mould / insect infestation) as well as feed problems. When was the last time you inspected your equipment recently? Why not have a Zeppelin service engineer do it for you? Give us a call on 01623 753291 to discuss your needs or email info@zeppelin-uk.com. 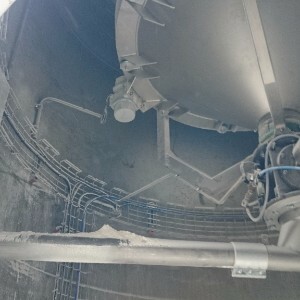 This entry was posted in Blog, Featured and tagged aluminium silo, new silo, old silo, Plant Engineering, silo, stainless steel silo, tailored solution, zeppelin. Bookmark the permalink.